Love was in the air this past weekend at our Fox Chapel Eat’n Park where we had the honor of hosting a very special event – a wedding! Cort and Janet met three years ago, at our Fox Chapel Eat’n Park. They were both struck with tragedy as Cort had recently lost his wife and Janet had recently lost her husband and daughter. They formed a friendship over their grief, and slowly, over time (and many decaf coffees and slices of Strawberry Pie), started to heal together. 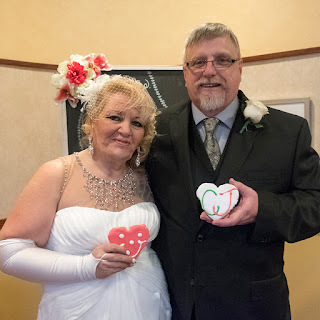 Every week, their love for one another grew and grew over their dates at Eat’n Park, and on Saturday, they were married in front of 25 of their closest family and friends at the place their story started – our Fox Chapel Eat’n Park! Congratulations, Cort & Janet! Best wishes for a lifetime filled with love, and of course, smiles!